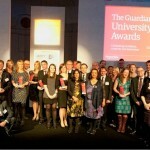 It may not quite be the Oscars, but the recent Guardian Higher Education Award ceremony in London was certainly an exciting night out, and I was delighted to come home with the award for Teaching Excellence. The award recognised my work in using digital modelling of ancient cities in my University teaching – both my large model of Rome, now nearing completion, and my course on Digital Silchester. Those projects have been the subject of various other posts and articles, by me and others, so I thought I’d post some thoughts here about the evening and the award itself. The call for entries was circulated in mid-October, just as the academic year was getting underway. The University collected nominations and decided which ones to enter; my suggestion for the HEA-sponsored Teaching Excellence category was selected and I was asked to write a series of 300-word paragraphs outlining my work, describing how it was delivered, stating its outcomes with relevant evidence, and listing any funding received. At this stage I was not particularly hopeful about the outcome; the entry process did not allow for any pictures to be added to the strict word count, and as mine is such a visual project I thought that this would limit how well I could convey it to the judges. In early December, however, I was excited to learn that I had been shortlisted (alongside the University of Nottingham’s 5-year pharmacy degree programme). To be one of two shortlisted entries was extremely gratifying, given the level of competition. I was pretty sure that I would not go on to win: all the other entries in the awards scheme, including Nottingham’s, seemed to be big projects run by groups of people, whereas mine is essentially an individual piece of work – albeit one strongly and consistently supported by my department and by the wider University. 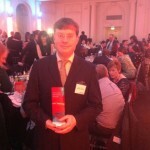 But to find out, I would be going to the awards ceremony in London in the new year. The 26th of February eventually rolled round, and I headed down to London in a very smart chauffeured car with Gavin Brooks, the Pro-Vice Chancellor (Teaching and Learning), and David Carter, one of my Faculty’s Associate Deans. The Guardian was hosting the awards in style at 8 Northumberland Avenue, a distinguished Victorian hotel building off Trafalgar Square now restored (after a period as offices for the Ministry of Defence) as a very grand conference venue. There were between two and three hundred people there, representing the shortlisted universities and the sponsors of the various awards. I had been shortlisted for a BUFAVC award for Learning on Screen in 2013, so the format of the evening, including the long and increasingly tense wait for one’s own award category to come round, was familiar. After an hour or so of high-decibel mingling over some very nice canapés and Champagne, we moved into the large ballroom, set out with tables (bearing yet more canapés) facing the stage. The evening’s host was Victoria Coren, who writes the poker column for the Observer. She moved fairly briskly through the award categories, keeping the evening moving along with good humour. The announcement of each category’s winner was preceded by a little video in which the chairman of the judging panel made some remarks about the field of entries – a high standard, difficult to choose, and so forth – and then a sentence or two about why they had chosen the winner (without revealing who it might be). The first intimation that I might have won came when the judges for the Teaching Excellence award said that they had chosen to reward a scheme that was about teaching, rather than about organising teaching – David and I had time to exchange a could-it-be? 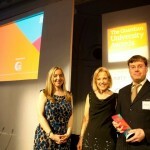 sort of glance, and then ‘University of Reading’ was announced as the winner – a really exciting moment. 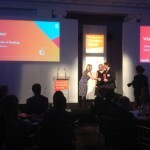 A burst of rather loud and lively music and some flashing lights gave me time to walk up to collect my trophy and pose for pictures, with Victoria Coren and Stephanie Marshall, the Chief Executive of the Higher Education Academy. David had prudently brought his iPad along and hooked up to the venue’s wifi to Tweet a series of images and messages. Like most events of this type now there was an official Twitter hashtag and a live video feed of messages, so we enjoyed seeing ours scroll past, and then seeing nice emails, FB posts, and Tweets pouring in. The excitement of winning a trophy at a big national ceremony was wonderful, and the sort of thing that does not come often in a career. The trophy is on my desk, my mother has a copy of the photos, and the whole thing left a warm glow that will, I should think, last a while. That apart, though, I was particularly glad about two things. One was the recognition for the support I’ve enjoyed from my departmental colleagues and students, and from the wider University. They have all consistently supported me through allowing me to try unusual new modules, through TLDF, Digitally Ready, and UROP grants and a University Teaching Fellowship, and more broadly through an environment that genuinely encourages innovation and the use of technology in teaching practice. Reading is very supportive to those willing to try something new, or adapt a practice or technology to their own subject. The second, connected to this, is that the HEA in judging the award chose to recognise a project that is essentially the creation of me as a single academic, which links my research straight into my teaching. The other award categories on the night reflected the nature of modern universities as large, diverse businesses run largely by committees and teams: there were honours for business partnerships, communications and PR campaigns, community engagement, facilities projects, HR initiatives, and so on. These are all important, but it does seem to me that research and teaching are really our ‘core business’, and in my own humanities discipline, the individual researcher/teacher model is still at the heart of a lot of what we do – though we work well as a team, my colleagues and I all enjoy pursuing our own specialised work and conveying it to our students. I was very pleased that this way of working was able to hold its own on the night.